Vintage has commenced earning its targeted 30% interest in the ATPs 743, 744 and 105 Deeps, in the Galilee Basin, from Comet Ridge Ltd.
Vintage has earned its 50% interest in PEL 155, onshore Otway Basin, from Rawson Oil & Gas Ltd. The Company has also signed a farm-in agreement with Somerton Energy Pty Ltd (wholly owned by Cooper Energy Ltd) whereby it has acquired a 25% interest and can earn up to a 50% interest and operatorship in PEP 171, a permit located onshore in the Otway Basin. Vintage has acquired a 100% interest in EP 126 from Beach Energy Ltd, which is located onshore in the Bonaparte Basin, Northern Territory. 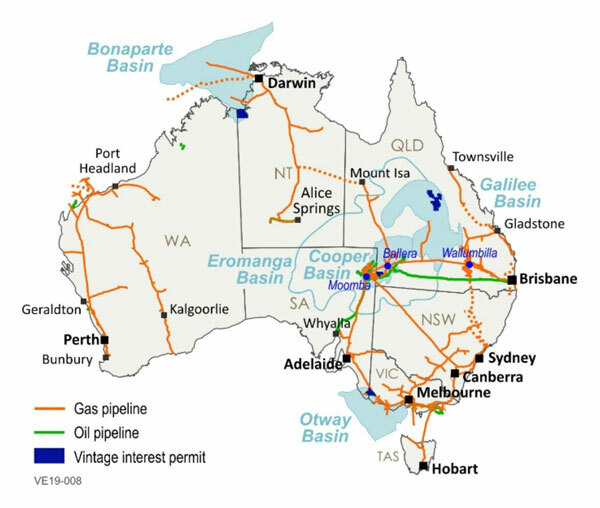 PEL 155 and the Galilee Basin permits have strong gas appraisal and/or exploration potential, with, the potential for early gas production to supply the Eastern Australian energy market. This market is currently in the midst of a supply shortage which is placing upward pressure on pricing to record levels. PEP 171 and EP 126 also have strong gas, as well as oil, exploration potential. The Galilee Basin, Otway Basin and Bonaparte Basin acquisitions are significant steps towards achieving that strategy.